A fourth man is being questioned in connection with the federal investigation the so-called Brooklyn ISIS conspiracy, law enforcement sources tell NBC 4 New York. Investigators want to know if this fourth man – located in Virginia -- played any role assisting three Brooklyn men who allegedly plotted to travel to Syria to join ISIS and carry out domestic attacks if they failed. Officials said this fourth man is now in custody in Norfolk, Virginia. He is being held on an immigration charge and has not been charged criminally in connection with terror. The investigation continues, law enforcement officials said, with the FBI looking into any potential ties he may have to the three suspects rounded up Wednesday -- 24-year-old Abdurasul Hasanofvich Juraboev, 19-year-old Akhror Saidakhmetov and 30-year-old suspect Abror Habibov. A fourth man is being questioned in connection with the federal investigation the so-called Brooklyn ISIS conspiracy, law enforcement sources tell NBC 4 New York. Chief Investigative Reporter Jonathan Dienst reports. Authorities allege the men -- two Uzbekistan citizens and a Kazakhstan citizen, all three of whom lived in Brooklyn -- conspired to join ISIS overseas and return to New York to shoot police officers and FBI agents if they failed. Two planned to travel; one is accused of funding the operation. The youngest man, Saidakhmetov, allegedly posted on an Uzbek-language website in the last six months that he would buy a machine gun and shoot police officers and FBI agents if his plan to join ISIS was thwarted, according to the complaint unsealed Wednesday. In August, 24-year-old Juraboev posted on the board that he would kill President Obama if ISIS asked him to and asked for help getting weapons, according to the complaint. Those who knew the young men were still trying to grasp the news Thursday. Zakarya Khan, the owner of Gyro King in Flatbush, where Juraboev worked as a salad preparer, said his employee became more quiet and reserved in the last month but he didn't seem radicalized. "I had never heard him, not even a single sentence, talk about politics or jihad or about army," said Khan. 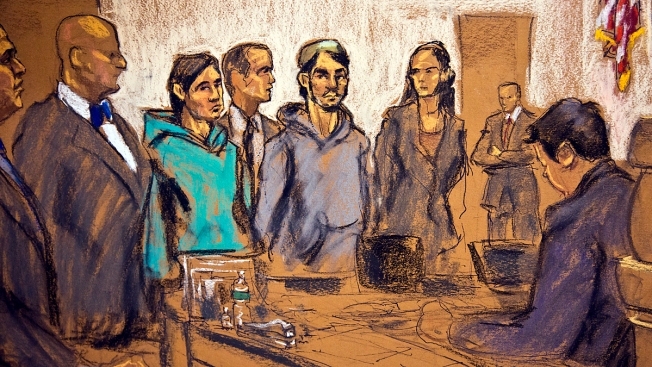 How did two young men from Brooklyn arrested in alleged plan to join ISIS become radicalized? Michael George has more. The president of the Vatandosh Uzbek-American Federation knew Habibov, the man arrested in Florida, and said he became alarmed after a recent conversation with him. "We had an argument with the gentleman about the way he understands Islam and the principles," said Farhod Sultan. "I don't want to dive into the contents of the conversation, but that was a red flag for me." Saidakhmetov was arrested early Wednesday at John F. Kennedy International Airport, where he was attempting to board a flight to Istanbul. Juraboev had already bought a plane ticket to Istanbul from New York and was scheduled to leave March 29. According to the complaint, the Habibov, operated a domestic support network that helped fund Saidakhmetov's efforts to join ISIS abroad. All three suspects have been charged with conspiracy to provide material support to a terror group, officials said. Juraboev and Saidakhmetov are being held without bail in Brooklyn. Habibov, who was arrested in Florida, was arraigned there Wednesday afternoon. Police Commissioner Bill Bratton said the suspects made statements that indicated their intent to carry out a domestic attack -- specifically by attacking police officers -- if they couldn't join ISIS. "This is real," the police commissioner said. "This is the concern about the lone wolf inspired to act without ever going to the Mideast -- or the concern of once they get to the Mideast, acquire fighting skills, capabilities and then attempting to return to the country." The Brooklyn arrests come about a month after an audio recording purportedly released by ISIS spokesman Abu Muhammad Al-Adnani urged supporters to carry out lone wolf attacks. The message was posted on Twitter and jihadi forums. Intelligence analysts said the recording, which praised recent attacks in France, Australia, Canada and Belgium, appeared to be authentic, NBC News reported. In September, members of online ISIS message boards encouraged similar "lone wolf" attacks on Times Square and other high-profile locations around the U.S. using homemade explosives. Bratton said at the time there was no credible information pointing to any terror plot against the city, though security was stepped up as a precautionary measure. Karen Greenberg, director of The Center on National Security at Fordham Law School, said young people looking for a place to fit in are often prime targets for radicalization. "Sometimes it's because they're looking for a home, sometimes they're looking for a community, they're looking for an acceptance they don't otherwise find," she said. The NYPD routinely enhances security based on threats or terror acts overseas, but the additional measures are in line with standard police procedure and not a response to a specific threat.